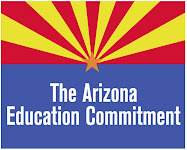 Arizona Education Network: Welcome to the Arizona Education Network blog! Welcome to the Arizona Education Network blog! Your AEN Blog Team is hard at work plugging in all of the informative links and resources on the sidebar, as well as getting our premier post published. In the meantime, please visit us at our website http://www.arizonaeducationnetwork.com/. Questions? Comments? Want to get involved in public education advocacy? Contact us at info@arizonaeducationnetwork.com. Hi Anonymous - Redirection of "voter protected" funding for First Things First and Prop 301 to the general fund will be on the November ballot. Keep in mind that the "balanced budget" includes the money from both these funding as areas (an assumption that the redirections of these funds passes on Nov. 2nd)as well as the passage of Proposition 100 - the one percent temporary sales tax. A move to revote all voter protected funding every eight years was defeated and will not appear on the ballot. That is all the information we have for now but we will post details as they become available. IN prop 100 itlooks like there is no room in this bill for any education higher than k-12. For everybody who actually thinks this will help us in the long run you are kidding yourselves. What we need to do is put it towards higher education costs like community/state colleges if we actually want to see a difference in the long run. Everybody knows that until kids are in college school is a joke to them for one. You could sleep and ditch your way to A's. For two the teachers dont even need to be that well qualified to teach until then. I could teach elementary school. Lets put the money somewhere where it will actually matter. Im voting No. So, I just have to ask what seems obvious to me. If we removed from schools all students who are not here legally, thus reducing the number of students, wouldn't if follow that there would be a reduction in funding needed? Prop 100 affects more than just k-12 education. I invite you to read through this link, that talks about how if it fails your property taxes will be permanently increased to fund jails, how the universities will have additional steep cuts that will equate to 50% of their funding in the last 2 years, and the repercussions to health care. Read this recent article - I care about our schools and our state as ALL of you do!!! We would have billions of dollars more in our state if we closed the borders. We are paying for illegals in prisons, education, health care, police officers (LIVES too!! ), on and on.... We need a penny increase in sales tax to work on closing the border!!! Throwing money at this huge problem is NOT the answer. My property taxes WERE raised for schools and fire services just RECENTLY. Fix the borders--I'll VOTE FOR THAT and we'll have all the money we need for services for ARIZONA CITIZENS!!! EXCERPTS FROM LETTER: "I'm Arizona State Senator Sylvia Allen. I want to explain SB 1070 which I voted for and was just signed by Governor Jan Brewer. Federal prisons have over 35% illegal's and 20% of Arizona prisons are filled with illegal's. In the last few years 80% of our law enforcement that have been killed or wounded have been by an illegal. The Federal Government has refused for years to do anything to help the border states . We have been over run and once they are here we have the burden of funding state services that they use. Education cost have been over a billion dollars. The healthcare cost billions of dollars. Our State is broke, $3.5 billion deficit and we have many serious decisions to make. One is that we do not have the money to care for any who are not here legally. It has to stop." Like many others I am concerned that our first response is to raise taxes. The last time we voted for money to go to teacher raises later reports showed that 70% of the money went to raises for the Administrators. I am not convinced this money is going to be allocated to the classroom which is where we need it. We have too many administrators to few good teachers who can afford to teach our children. Also the General fund haze is a loop hole I don't like seeing. Although I don't want to see anymore good teachers lose their jobs, I think what is first needed is a complete audit of the state’s school budgets. As a parent, I witness daily and year after year wasteful spending by the schools that is not their fault, it comes from above. It is time those setting the school calendars, curriculums and budgets got their hands dirty and looked deeper. We think you will find it helpfull. I have heard that there is alot of fat that needs to be trimmed at the top in the state board of education office. Is this true? Why not start at the top and look at what we can consolidate/fat trimming etc.